He also ran into a glass wall and then threw up. 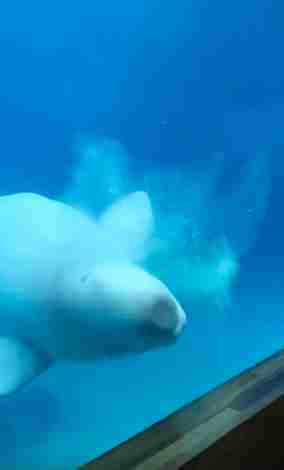 In a recent video, a young beluga whale swims to the side of his tank as a group of children watch through the glass. When the beluga reaches the wall, he bumps his head against the glass. A moment later, he throws up. “Ewww,” a child cries as the water clouds with the beluga’s regurgitated food. The video was shot last week by a visitor to Marineland, a controversial marine park in Niagara Falls, Canada. Phil Demers, former senior whale trainer at the park, is not surprised by the events — chronic regurgitation is a common issue for captive animals, and Demers believes that this beluga whale was either sick or highly stressed. Naomi Rose, a marine mammal scientist at the Animal Welfare Institute (AWI), has similar concerns as Demers. “All I feel one can reasonably say from this short video is: The beluga was in some way distressed because it was regurgitating its food,” Rose added. 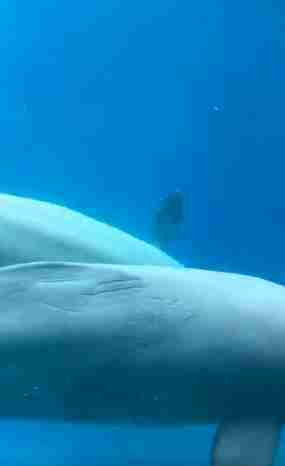 Rose also has concerns about the beluga banging his head against this tank, although she said that it’s hard to analyze this behavior based on a short video. 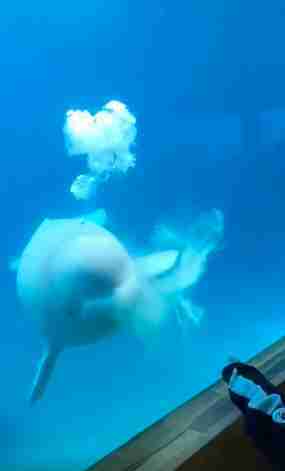 After the beluga whale throws up, he bumps his head against the glass several more times. Then he swims to the side, revealing a series of rake marks along his torso — rake marks are injuries caused by whales “raking” their teeth against each other while fighting, and these injuries appear on many whales and dolphins living in captivity. “The rake marks were deep and strongly suggestive of aggression with one or more tank-mates at some point in the recent past,” Rose said. While it is possible for wild belugas to injure each other in similar ways, Rose explained, these marks are rarely seen on young belugas in the wild. This video is just the latest in a string of welfare accusations against the park. In 2016, an extremely emaciated walrus named Zeus appeared on stage during a performance and nearly collapsed. Another resident walrus, Smooshi, developed regurgitation issues at a young age, and was mostly hidden from the public for years. 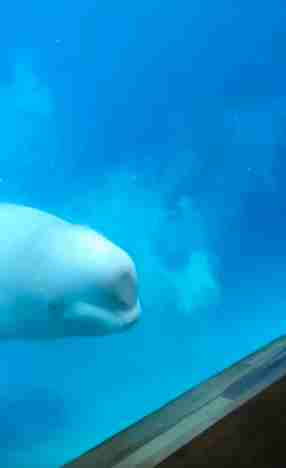 Other belugas have suffered at Marineland as well. 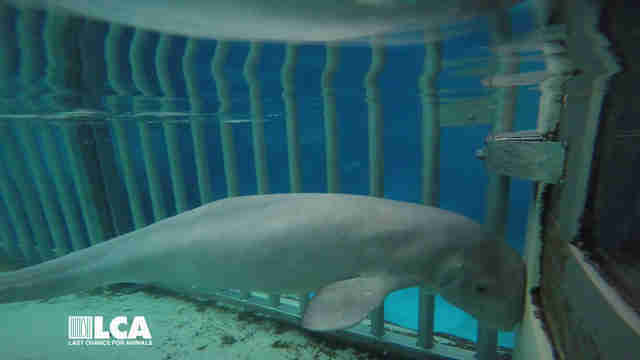 In 2012, a baby beluga died at the park after being mauled for two hours by two adult belugas living in the same tank. And in 2017, a young beluga named Gia died after becoming sickly and emaciated — animal welfare advocates believe the young beluga went downhill after being removed from her mother before she was finished nursing. But it’s not just marine animals who have faced mistreatment and neglect at Marineland — the park’s land animals have too. In 2016, the Ontario SPCA charged Marineland with five counts of animal cruelty for neglecting its animals, including birds and bears. Several months later, the park received an additional six animal cruelty charges for mistreating elk, red deer and fallow deer. Marineland did not immediately respond for comment about the recent video of the young beluga whale. Despite the numerous problems at Marineland, there’s something to be hopeful about — Demers and other animal welfare advocates have been working tirelessly to expose the animal welfare issues at Marineland, and to protect the animals living there.